We offer two tank dive trips to the islands of Koh Rong, Koh Rong Samleum and Koh Koun. We meet in the morning in our office to go out to The Dive Shop on Koh Rong Samleum. You will be back in time to catch the night bus going to Bangkok, Phnom Penh or Ho Chi Minh City, as our boat leaves from the pier at 4pm and depending on weather conditions, usually arrives back at the shop in between 6 and 7pm. The overnight trips take you to the island of Koh Rong Samleum where we have a brand new dive center just in the center of our private white sand beach. From here with the right conditions you can spend the evening watching the sunset at one of the most remote island location in Cambodia, a truly amazing sight. Remember to take your camera as this is well worth a few pictures, especially during the full moon period. The Dive Shop offers a dormitory for our guests traveling of a small budget upstairs of our dive center. It is clean, with mosquito nets on all the bunks and is the place to meet divers from all around the world or just hang out at the campfire. For our guests wishing a bit more privacy, we can offer beautiful bungalows in our resort at the further end of the beach. 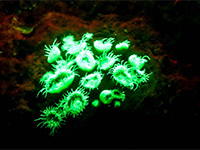 If you think you’ve seen it all under water it’s time to try a UV or Bio-fluorescent Night dive. You will see things you’ve never seen before and see the things you know and love under a whole different light… literally. What most of us don't know is that there is an entire ecosystem of glow-in-the-dark creatures beneath the surface of the ocean. Scientists are in the process of studying the underwater creatures, trying to learn how they light up and why. 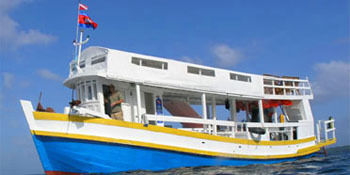 Cambodia scuba diving offers a diverse undersea experience along with a huge amount of top dive sites. 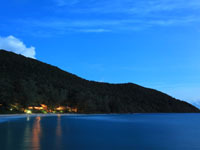 The best diving destinations are the islands of Koh Tang including Virgin Reef, the islands of Koh Prins and the far off the coast island Koh Pulawei. Come and join us for an overnight trip to discover the unspoiled and almost undived sites around the outer islands. 5 Star Service, Exploration Trips and hand-made trips to the far away islands are an option as well when diving with The Dive Shop. 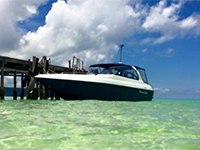 We have deals with several charter boats based in Sihanoukville; the by far most popular choice for our guests is the 500 hp Speedboat 'Princess Elina' when visiting the outer islands. 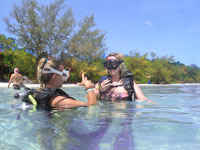 Of course we offer snorkeling trips on sites around Koh Rong, Koh Rong Samleum, Koh Koun as well as Koh Tang and Koh Prins. All non-divers are more than welcome to join us on our dive boat for snorkelling, a unique experience in the Cambodian Waters. The Islands of Koh Rong, Koh Rong Samleum and Koh Koun offer a rich marine life as well as colourful hard and soft corals.